We're at a turning point in how we describe Web-based innovation trends, and the ascendant term is "social media," according to a study by Justin Kistner posted on Socialfresh. Moreover, Facebook among those media is so popular that no other search term in Google beats the volume for "Facebook," Kistner finds. 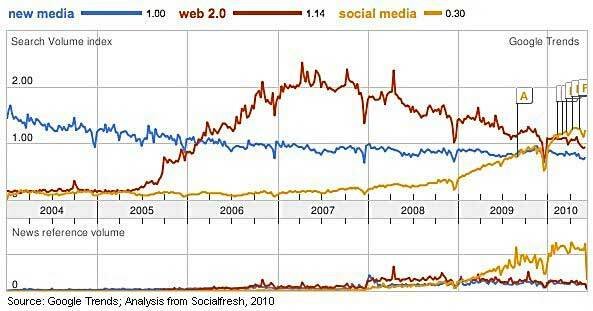 Below, a comparison of search volumes for the terms "new media," "Web 2.0," and "social media" from 2004 to early 2010. The term "Web 2.0" became popular in 2005 and peaked in mid-2007 (measured by the number of times that term was entered as a search term in Google). Toward the end of 2008, the term "social media" started to gain popularity, climbing steeply in 2009. The news media never fully adopted the term "new media" (see News reference volume section above)—perhaps because the term was insulting to traditional media, painting them as "old media," writes Justin Kistner. The news media did start to adopt "Web 2.0" in late 2007 to mid-2008, but that was relatively late in the game.